RUBY ISLAND A JEWEL IN LAKE WANAKA OTAGO NEW ZEALAND. 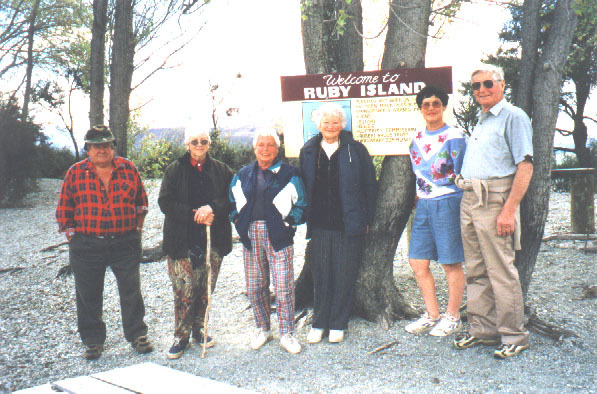 Ruby Island was originally known as Roys Island, named after the area's original pioneer settler from whom, the bay where the town of Wanaka is situated, the nearby Peninsula and Peak are also named. Another name for it, shown on early maps, was Merino Island. This theme of pastoral animal names may be connected with some of the other Lake Wanaka islands called Bull and Ram (Now Moua Tapu).The Maori name is Matakitaki ( To gaze upon ) named by the Ngatimamoe Chief who opened up the link between the West Coast and Wanaka. The origination of the name Ruby is not known but it is thought that it comes from the island's shape and the fact that it is a jewel on the lake.The Island was formed from remnants of Glacial rock about 20,000 years ago. Because it is situated in a dry zone receiving only about 640 millimetres of rain per annum the original vegetation was generally stunted shrubs and trees, consisting of Kanuka, Manuka, Flax, Kowhai, Corokia, Coprosma, Cabbage trees and Pitasporams. 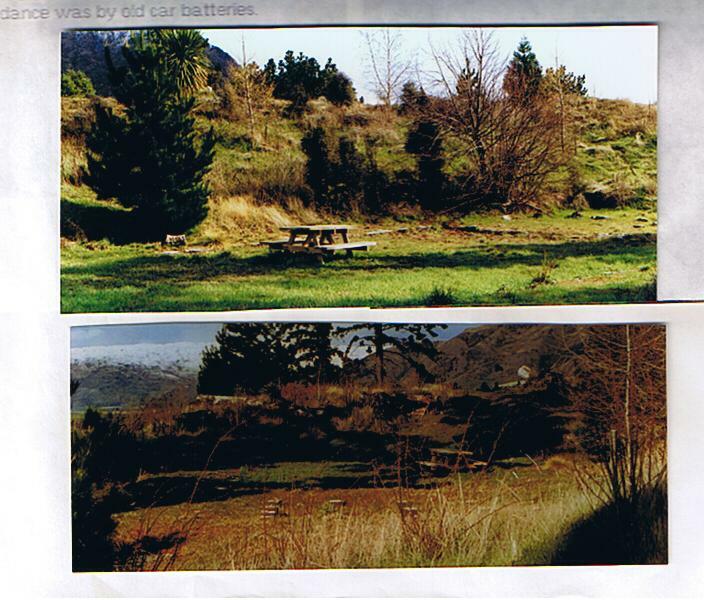 It was gazetted as a reserve in 1886 and was administered by the Wanaka Domain Board. 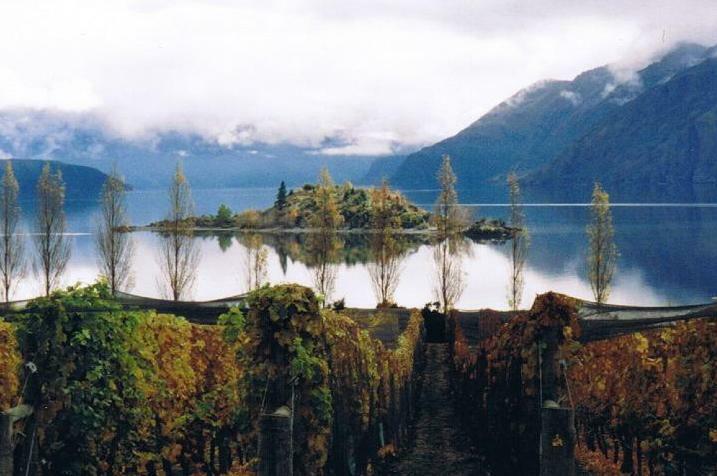 Up until 1988 the Queenstown Lakes District Lakes District Council administered all 5 islands on Lake Wanaka. After 1988 the Department of Conversation took over administration of all Islands except for Ruby which remains under the control of the QLDC managing a Department of Conservation approved plan. The island is home to native mountain ghekos and giant ground wetas. The islands close proximity to Wanaka make it an ideal picnic spot for boat owners, kayakers and sometimes even swimmers. The handiness of the Island also means some of the many visitors do not appreciate the facilities there and unfortunately vandalism is common and so have been destructive fires. If this site can in some way encourage people to take an interest in the wellbeing of this precious jewel and the many other beautiful places on this planet the writer will be well satisfied. Ian Gazzard Editor. 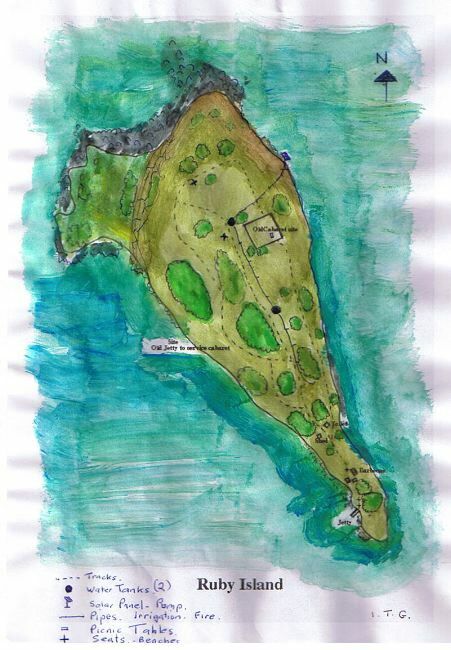 Sadly Ruby Island has suffered from many fires over the last 120 years or so the latest being in 1992. After this disaster which ruined many previous years of work by local volunteer groups a decision was made to place water tanks in a strategic site for irrigation and fire control. The successful installation of this in 1995 has greatly assisted in the re-establishment of many trees with the emphasis in planting native species. A gas operated, free to use, barbecue also enables visitors to enjoy a picnic without lighting fires which are prohibited. View from Rippon Vineyard pre 1992 fire. View from Rippon Vineyard 2001 post fire, showing new plantings. Commercial activities are not allowed on Ruby Island although a tea rooms cabaret was built in the lates 1920's, by the Hunt family who ran the ferry service on Lake Wanaka, which lasted about 3 years, The building was salvaged and most parts were removed to Wanaka. The old flag stones and foundation piles are still visible in the natural depression on top of the island. The rustic beech poles which supported the cabaret are clearly visible. circa 1929. Cabaret site showing the old concrete piles and surrounding flag stone porch. Top looking north. Lower looking south. Winter circa 1991. Island revisited - L. to R. George Studholme former Wanaka Domain Board Chairman, Gwenda Rowlands nee Manson , Ruth Hunt, Joan Robertson nee Manson, Sally Gazzard , Bill Hunt son of former cabaret proprieter John Hunt. Ruby Island along with the other Islands on Lake Wanaka is home to the giant ground weta. 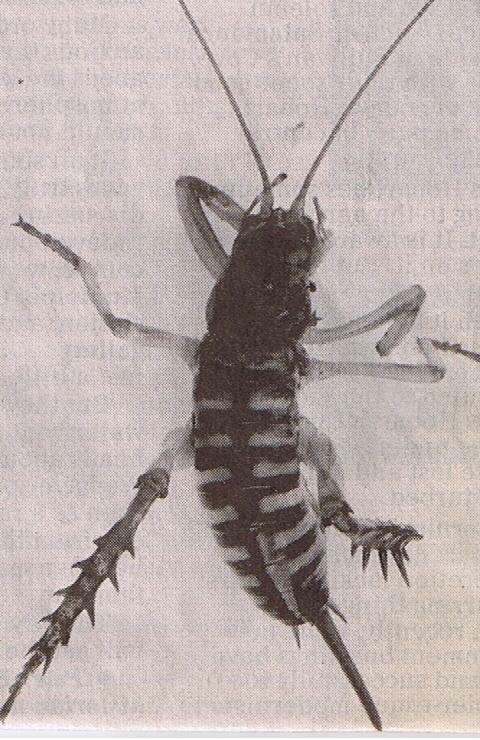 This insect is now only living in a few remote places in Otago. These are some fish caught in Lake Wanaka on the same day near Ruby Island and show an example of the three species of game fish available. 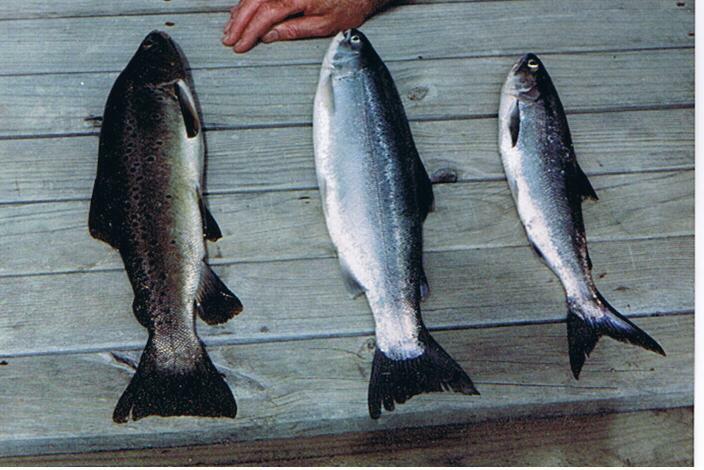 Left to right Brown Trout, Rainbow Trout and Quinnat Salmon which are now land locked due to hydro electricity dams being constructed on the Clutha river. 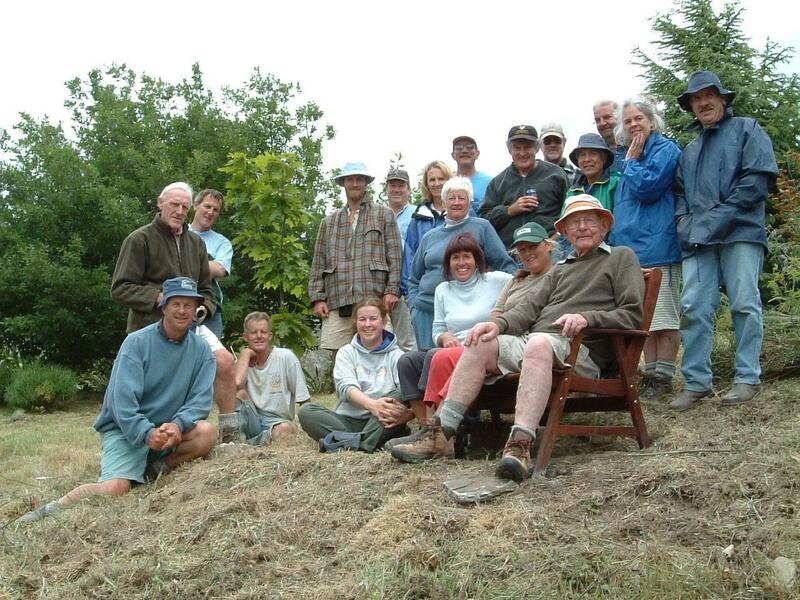 Local Wanaka volunteers at a working bee held on 3rd December 2005 when a seat to the late Q.L.D.C. councillor Peter Rennie was dedicated in appreciation of the work and time he gave in helping with the on going work to beautify and restore Ruby Island.